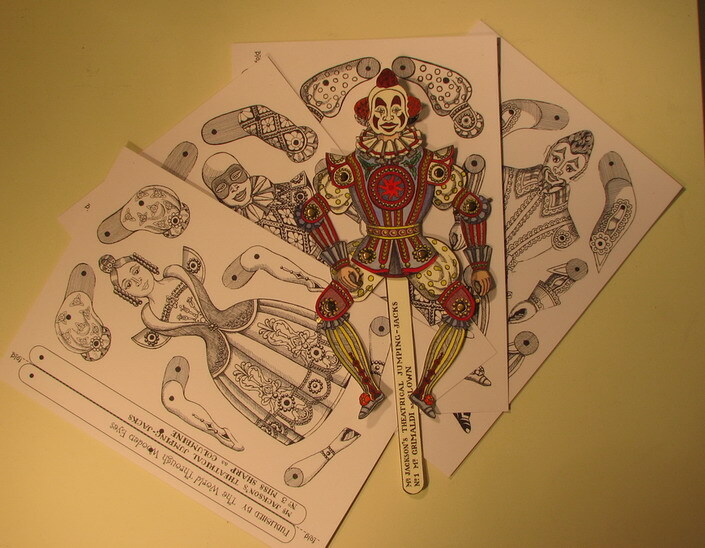 These Jumping Jacks were created by Toy Theatre designer Peter Jackson. They are available here for you to download as a PDF file. We recommend that you print them out on 300gsm weight paper or card. To make it you will need scissors, a punch or skewer to make the holes for the joints, paper fasteners or string for the joints and a little glue. All the Jumping Jacks are in black & white. The coloured one illustrated below is an example colour scheme only. The pack consists of 4 sheets and makes 4 jumping jacks.